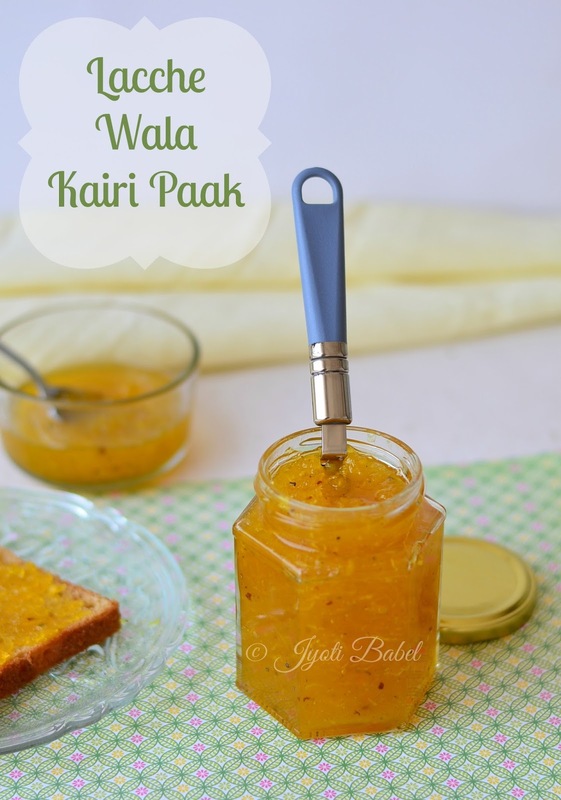 Lacche Wala Kairi Paak or Instant Sweet Mango Pickle is a sweet Indian condiment that is prepared by cooking raw grated mangoes in sugar and is then flavoured with cardamom and saffron. Growing up I remember my brother loved this and my nanima (maternal grandmother) would make it for him every now and then when green mangoes were in season. This sweet pickle is one of DH’s favourite condiments too. That is perhaps one of the reasons why you will find a big jar of this raw mango jam or Kairi Paak (as called in my mom’s place) or Mitha Achar (as called in my in-law's place) in my house every year during the mango season. Even though it is a staple in my house, I never have to make it on my own. Every year either my mother in law or DH’s maternal grandmother sends us a bottle of freshly made Kairi Paak as soon as raw mangoes are available in the market. This year was no different. But, maybe it was high time for me to make it on my own, so one fine day that jar broke (Thanks to baby M but thankfully no one was hurt). When I picked the condiment theme for my second leg of Blogging Marathon, a monthly event that is the brain child of Srivalli, I decided to try this out. Grated raw mangoes are used in making these. So, the texture of the final product is not smooth. This texture sets it apart from the sweet mango chutney which is altogether different both in taste and process of making. 1. In a thick bottomed pan mix the raw grated mangoes with sugar and heat it. Do not add any water. The sugar will melt as the mixture gets heated. 2. Keep stirring while it is getting heated for about 10-15 minutes and you will see that the strands of raw mangoes will start becoming translucent. The sugar syrup will also thicken. 3. At this point turn off the heat and add the saffron and crushed cardamom pods. Stir well and let it cool completely before storing it in a clean airtight glass jar. 4. It stays well for about 2-3 months when kept in the refrigerator. 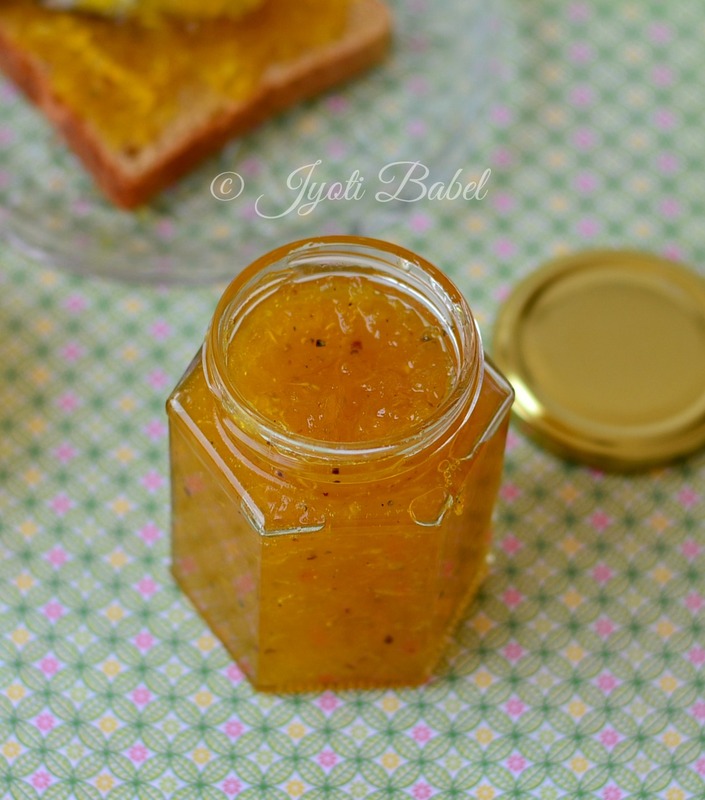 You can use it on bread slices as a jam or as a pickle in your regular meal. 1. Do not add water to cook the mango and sugar mixture. Even for rubbing the saffron, just use a few drops. If you add saffron without rubbing, you will not get a nice yellow colour in the final product. 2. If you make this in larger quantity, cooking time will need to be adjusted accordingly. 3. Typically, an equal amount of raw grated mango and sugar is used. But, you may decrease the sugar quantity to suit your taste buds. This sounds like an instant version , the original version is where they leave sugar and mango in the sun ...yes for days till the sugar melts . This version is quick and easy , must give it a try . Such a sweet mango relish. Its so similar to the Gujarati Chundo we make but sweet. I would love to have it with some bread. OMG! My mouth is just watering looking at the pictures. Bookmarked to be made soon. This is a totally new mango chutney for me. Sounds sweet, sour and delicious. Love it I sued to make it regularly in the past. Unfortunately now no one even I am avoiding sweets so do not make this yum treat. Oh wow.. how many varieties of mango relish... Amazing. Love the addition of saffron. Wish i get a super huge bottle of this delicious sweet mango pickle, totally droolworthy. Indeed a delicious share.. The colour of the chutney looks so inviting!! The quick version sounds so tempting. Wish I could get raw mango now to try it.